The Casio Privia PX 160 features a multi-dimension AiR sound generation source making playing a real pleasure. This digital piano features 18 authentic tones which sound great through the new 2 x 8 watts speaker system. A line out can connect the piano to external loudspeakers for jamming sessions or performances. Casio's AiR Sound Source gives the PX 160 it's meticulously recorded and reproduced sounds. The sound system delivers seamless dynamics for a truly expressive performance and Damper Resonance is simulated by AiR for realism when the damper pedal is used. 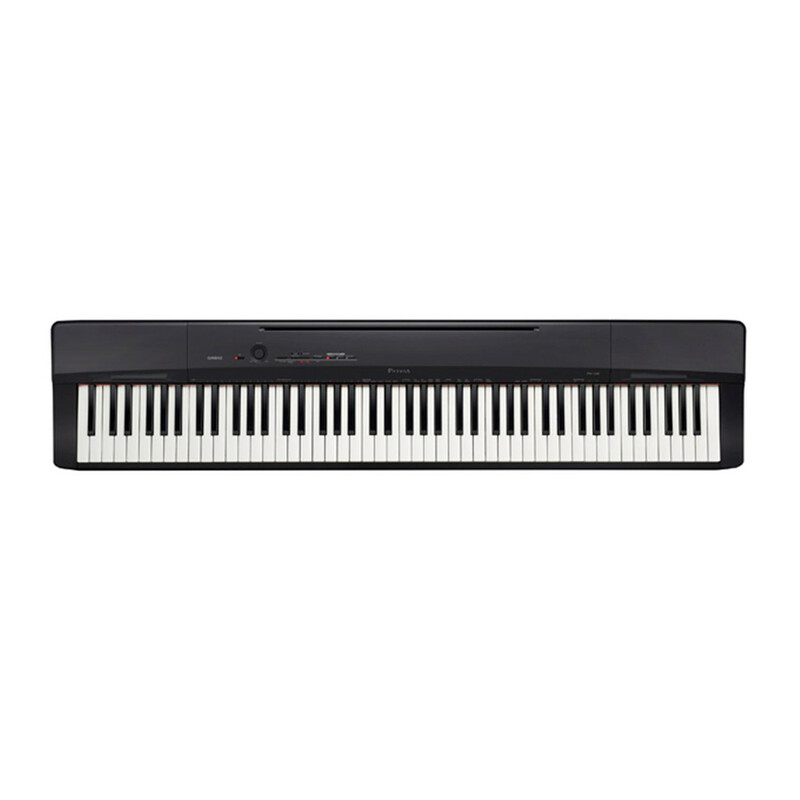 The Casio PX 160 uses a Tri-Sensor Scaled Hammer Action II keyboard with new simulated Ebony and Ivory textured keys for an incredibly real feel. Its three sensors capture the dynamics of performance with speed and accuracy. This hammer response takes into consideration the speed at which the different sized hammers move inside an acoustic grand piano relative to the velocity the keys are played. This piano's chassis has been redesigned for a more elegant look and accommodates a new 8w x 8w speaker system which delivers a rich and remarkable sound. This speaker system is open to the front but also ported to the back which provides great sound when the piano is placed up against a wall. This makes it easy and convenient to use in a classroom or home environment. The PX 160 has newly developed string ensemble sounds that sound great alone or layered with the grand pianos, electric pianos, harpsichord and more. 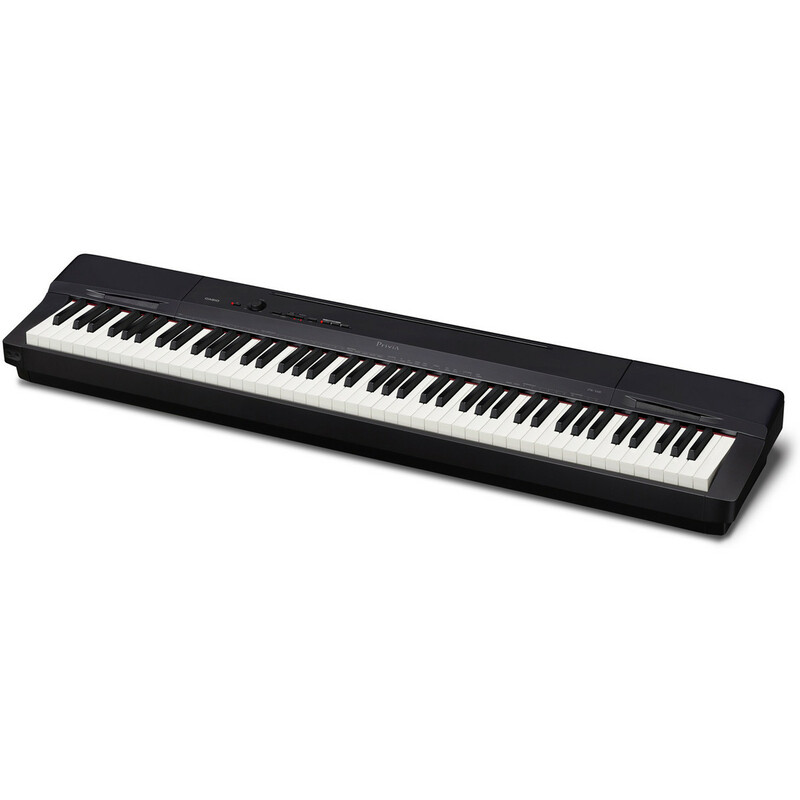 The electric pianos have been updated providing dynamic sounds derived from Casio's award winning PX-5S stage piano. The PX 160 has split and layer functions allowing you to play bass in your left hand and have two layered tones in your right. Duet mode allows the keyboard to be split into two equal ranges, so the student and teacher can use the piano simultaneously. A two track recorder can even record and playback your practice and performances. The optional CS 67 stand puts the PX 160 at the ideal height and the optional SP 3 pedal system provides the same 3 pedal functionality as a grand piano. The PX 160 has two headphone outputs on the front and 1/4" left and right line outputs on the rear panel. Class compliant USB connectivity is also supplied which means the piano can be used with Mac or Windows computers without downloading drivers. It also means that the piano can be used as a controller with the Apple iPad with Apple's Camera Connection Kit.